On December 28th 2018, the world lost a true American television treasure. But more than that, a truly genuine and nice person. Mr. Steve Hall, known to millions of country music and puppetry fans as the creator and longtime performer of Shotgun Red, passed away far too soon at the age of 64. Many country music legends are gathered today, February 2nd, at the Nashville Nightlife Dinner Theatre, for a memorial in Steve’s honor. Red was the sidekick to Ralph Emery on The Nashville Network’s flagship program, Nashville Now. In more recent years, Steve Hall performed residency shows with his band at different Nashville venues, including the Dinner Theater where his memorial is being held on this day. The band also toured the country. Every performance would end with an all-to-brief appearance by noneother than Shotgun Red. Also in recent years, Hall found success with a YouTube cooking channel that showcased him, along with his fiancee Miss Sheila, teaching viewers how to make easy-to-prepare yet delicious dishes. The channel was notoriously devoid of a comment section, so that everyone from the little kids to grandparents who remember Red from TV could watch the online videos without fear of reading anything inappropriate. It was a winning recipe that netted Hall–by then in his 60s–over 100,000 subscribers. There seemed to be no end to Hall’s talents, as he was also an inventor. He created a breading mix for catfish and Crappie, as well as a fisherman’s utility device called the Skinny Dipper. The Dipper does a bunch of things, including allowing users to measure and cut their fish, pull up water from the lake, and a whole bunch more. I mention this for two reasons. Number 1, when we were in Nashville interviewing Steve, which you will hear shortly, he actually showed us the first prototype of the Dipper, and we thought it was ingenious! He talked up all the features, and it was just a plastic sample he got from a demo-maker. It was just a little thing, but it made us both so happy that he would do that. I immediately called him. We thanked him and he explained that he thought since he had already calculated shipping for 3 boxes, why not add an extra one? Turns out he was grateful for the big order of 5 Dippers. He was my friend, and we would talk often on the phone. That last phone call about the Dippers was around December 20th. Just a week later, Steve would pass away suddenly while fishing. 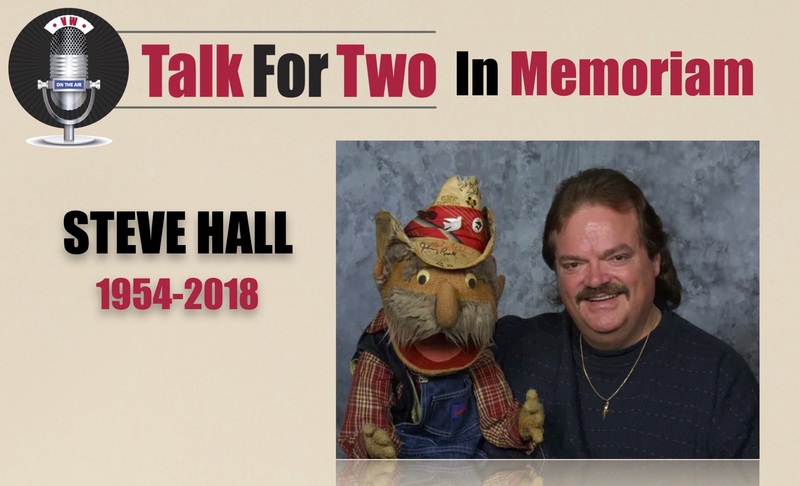 Talk for Two had the distinct honor–two years apart–to speak to both Steve Hall and Ralph Emery. Both the interview with Steve and Red are first, and Ralph’s full interview is afterward. Feel free to listen to both. There will be no interruption between the two. Not that it is my place to do so, but something has compelled me to put those two great men together one last time. Here also is a link to Steve performing with his former band, Southbound 76, on Nashville Now. Steve Hall, thank you for the laughs, the music, and the memories. But most of all, thank you for your hospitality and friendship. I am just one of many who will never forget your talents and humanity.